Selling digital products the simple way | Can Do Can Go! Fortunately, a third option has arisen in recent years that allows creators of digital products to do exactly that. 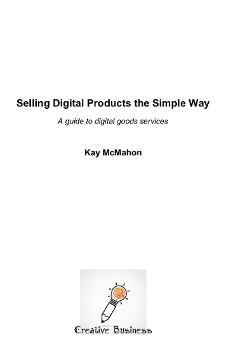 The providers of this third option are known as digital goods services, and they’re the subject of Kay’s report, Selling Digital Products the Simple Way . This 30-page PDF report begins with an outline of how digital goods services (DGSs) work and their strengths and weaknesses compared with the alternatives of marketplaces and of fulfilling orders manually. It moves on to look at how the DGSs typically charge the seller for their service – charging per transaction on one hand, or charging by storage space and/or number of products offered on the other – and their respective advantages and disadvantages depending on what you’re trying to sell. Of course, price and profit aren’t the only consideration, and the report mentions some of the other things you might want to look out for when choosing a DGS. In the third section of the report, Kay looks at six of the leading DGSs and what they have to offer. There’s a description of each of them, their pricing model and the particular features they boast, as well as Kay’s impressions of how easy to use the service is and how strong its online support facilities appear to be. (And a list of fame – the bigger DGSs regard their celebrity users as a big selling point!) Each of these pen pictures is concluded with an overall verdict on the service. The last section of the report compares the DGSs head-to-head – first by creating four typical seller scenarios and running each of them through the six DGSs’ pricing structures to see how much money the seller would eventually receive after PayPal (in most cases) and the DGS have had their cut. The results are set out in a table for ease of comparison. Because profit isn’t everything, a second table compares the various features offered (or not) by the six services. The section concludes with an explanation of how to calculate your own scenario and work out how much you’d be left with from your monthly sales. The report has a companion price comparison online tool, which you can use to calculate the prices charged by the six DGSs (and the payment processor) for your portfolio of digital products. Just enter the relevant figures, hit the button, and it does all the number-crunching for you! This report isn’t a case of “Do as I say, not as I do”! We ran our own calculations based on our own predictions of sales, and established that Gumroad gave us the best deal. As the report explains, if our circumstances change we might decide to switch to another DGS, but Gumroad will do just fine for now. You can obtain the report through the links below. …oh yes, price. You’re probably wondering how much the report costs, aren’t you? The answer is: it’s up to you! It’s a 30-page report, not a 600-page potboiler. But we think it’s a well-researched piece of work, and a handy tool, both of which really will help people in choosing the right DGS (if any) for them. We reckon a dollar would be a bargain. (That’s currently 59p, if you’d rather pay in sterling.) If you think it’s worth more, obviously we’ll be delighted! If you’d rather download it free at first and then decide how much you’d like to pay later (perhaps after you’ve made your fortune with the DGS of your choice), that’s fine too. Whatever you decide to pay, we’d appreciate your feedback, so please comment below! This entry was posted on Tuesday 22 April 2014 at 11:49	and is filed under Earning money, News. You can follow any responses to this entry through the RSS 2.0 feed. You can leave a response, or trackback from your own site.